Flotats, X.; Fernández, B.; Palatsi, J. 13th World Congress on Anaerobic Digestion (AD13). Flotats, X., Fernández, B., Palatsi, J. 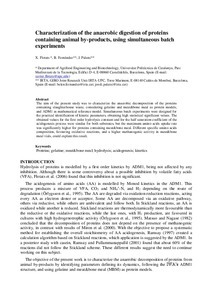 Characterization of the anaerobic digestion of proteins containing animal by-products, using simultaneous batch experiments. A: World Congress on Anaerobic Digestion. "13th World Congress on Anaerobic Digestion (AD13).". Santiago de Compostela: Internatinal Water Association (IWA), 2013.